How To Make Salted Caramel Hot Cross Buns. Fancy making some Salted Caramel Hot Cross Buns? These sweet use Shaken Udder Salted Caramel Milkshake instead of milk to create a sweet and luxurious take on an Easter classic! 5. When the buns are risen, heat the oven to 220ºC/fan 200ºC/Gas Mark 7 and make the crosses. Mix the flour with the water to make a paste. Pour into a plastic food bag and make a tiny nick in one of the corners. Pipe crosses on each bun. 6. Bake for 12-15 minutes until risen and golden. Brush with golden syrup. The buns will keep fresh for a day, and after that are best toasted. Cook’s Tip: Using a pre-prepared white bread mix cuts down on the time factor, but still produces delicious. 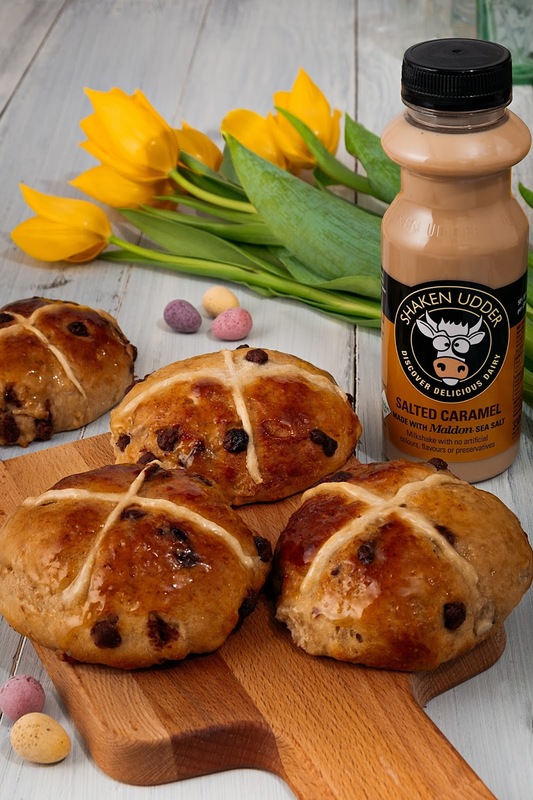 How To Make Salted Caramel Hot Cross Buns Recipe courtesy of Shaken Udder. What do you think of these Salted Caramel Hot Cross Buns? Hot Cross Bun Recipes For Hot Cross Bun Day. Mini Christmas Cakes: How Sweet And Adorable? "Ginger And Chocolate Pot: Valentines Treat"
"Staring Competition But He Always Wins: Wednesday Blog Hop…"
Oh I love hot cross buns. An interesting twist to the recipe, I might have to try this!